Tribune Model School showcased the Annual Musical Presentation entitled “Pulkit, Tales of Sunshine” by 198 students of Class V to X under the marvelous direction of Mr. Vijay Kumar at Tagore Theatre on 30th November, 2018. The pandavas’ horrifying dreams paved the way for Lord Krishna played by Sumit to disclose the profound truth about Kalyug. Today’s confusing and hypocratic society was shown by Trivedi family. The child played by Bhuvraj was confused between wrong and right as his parents were no role models for him. The guidance and love of Ms. Anne Sullivan enacted by Sarika displayed transformative impact on Helen Keller played by Niharika who had no access to the world and human connection. Shivansh as Ashtavakra portrayed the deepest truth underlying the importance of being focused on the right things at all times. Similarly Mr. Gandhi play by Ranveer focused on the “positive” in every situation. The audience enruptured into a loud cheer by the Dashavataar song, composed by Mr. Atul Kumar Dubey and the dancing steps of the students choreographed by Mr. Rahul Gupta thrilled present there. The creative set design and properties by Ms. Amanpreet and Ms. Harinder brought an illusion of realism and translated it into an actual visualization on stage. Principal Ms. Vandana Saxena applauded the students and teachers for their captivating performance. Almost 227 students of the Tribune Model School participated in the 7th Annual Athletic Meet at the Sports Complex, Sector 7, Chandigarh. The sporty morning began by invoking the blessings of the Lord Almighty followed by exciting races for the students of Classes I – V. The zeal and enthusiasm of the students conformed with the motto of the theme “A sportsperson with discipline is the sportsperson with a winning spirit.”, creating an energetic atmosphere on the field. The races of the day comprised of 50 metres race, hurdles race, skipping race for Classes I – III and 400 metres boys 200 metres girls and Long jump for Classes IV & V.
Tribune Model School witnessed great energy and sportsmanship amongst the students on the second day of the 7th Annual Athletic Meet held at the Sports Complex, Sector – 7, Chandigarh. Classes IV & V displayed outstanding vigor during the Finals of Long Jump, 100 meters, 200 meters, 4 x 400 meters mixed relays and 4 x 100 meters relay races. Students of classes VI – X enthusiastically participated in the 100 meters races and Long Jump for which the finals will be held tomorrow. On the third day of the 7th Annual Athletic Meet of Tribune Model School, the students of classes VI – X displayed intense passion and sportsmanship on the field. The Sports Complex of Sector – 7, Chandigarh came alive with reverberant performances of the budding sportspersons. The wide array of events during the day comprised of Shot-put, High Jump, 100 meters, 400 meters, 800 meters, 1500 meters and relay races for U – 14 and U – 17 categories. The high powered and dynamic performances of the students got the spectators on the field, cheering the winners. The 7th Annual Athletic Meet of the Tribune Model School culminated amidst zeal and brilliance catalyzing the Motto of the Meet “A sportsperson with discipline is the sportsperson with a winning spirit.” The students of Classes VI – X participated with great vigor to bring out their best in High Jump, Shot put and Javelin Throw in addition to the other races that formed the highlights of the event. Dr. M.S. 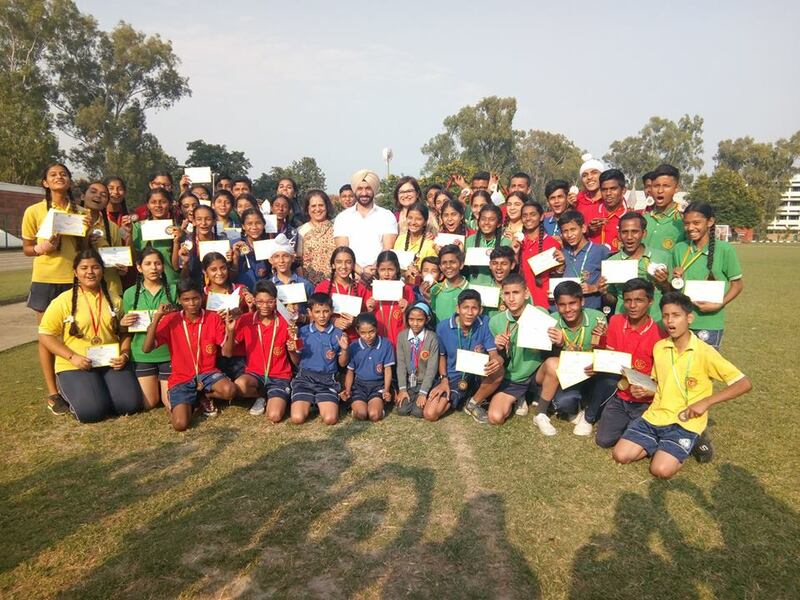 Narula, the guest of honour and renowned Orthopaedician along with Mrs. Chand Nehru, Chairperson, Tribune Model School awarded certificates and medals to the students at the Sports Complex of Sector – 7, Chandigarh. Akhil, Ashley (Classes I – III), Kartik, Soni (Classes IV – V) and Sumit, Jaspreet (Classes VI – VIII) and Harsh & Khushboo (Classes IX – X) emerged as Best Athletes for their outstanding performances during the Meet. The pique of the event was the announcement of the House Trophy which was bagged by the Dronacharya House. Dr. M.S. Narula, the guest of honour for the day congratulated the budding sportspersons and encouraged them to imbibe a healthy lifestyle. The 3rd Tribune Trust Football Tournament (2018-2019) embodying the spirit of the motto ‘A TEAM ABOVE ALL; ABOVE ALL A TEAM’, started with a lot of zeal and enthusiasm at the Tribune Model School. Ten schools – Ankur Public School, Carmel Convent School, Chandigarh Baptist School, Infant Jesus Convent School, Sacred Heart School, Sri Guru Harkrishan Public School, St. Joseph’s School, St. Peter’s School, St. Xavier’s School and Tribune Model School participated in the three-day event. 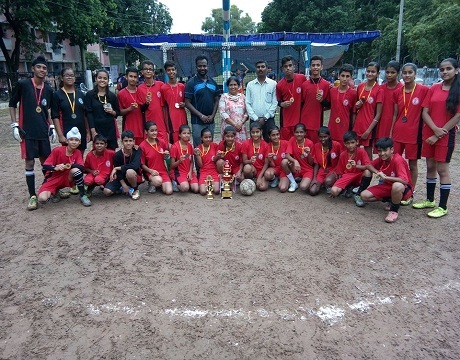 The Boys team of Ankur Public School and the Girls team of Sacred Heart School emerged as the winners of the 3rd Tribune Trust Football Tournament organized by the Tribune Model School from 8th October, 2018 to 10th October, 2018. The First Runners up Boys were Tribune Model School and First Runners up Girls were St. Xavier’s School. The Second Runners up was Carmel Convent and the Second Runners up Girls were Tribune Model School. The guest of honour for the day was the Trustees of Tribune Justice S. S. Sodhi and Mr. Gurbachan Jagat. The trophy for the Best Payer for Boys went to Harsh Yadav, Tribune Model School, who scored five goals in the tournament. The trophy for the Best Player for Girls went to Pushpa, Tribune Model School, who scored four goals in the tournament. The tokens of appreciation were given to the coaches of the teams of the top three positions. Mr. S. S. Sodhi addressed the young talent and appreciated them for their achievements. Emphasizing upon the spirit of “Empowering Holistic Education”. 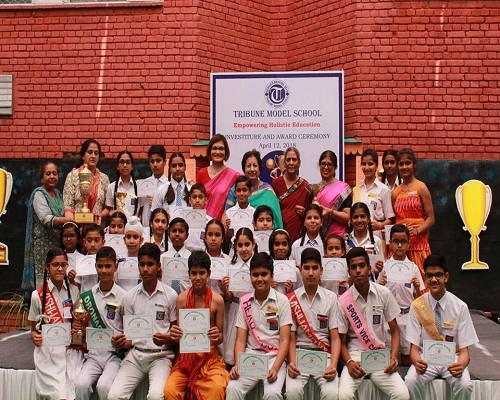 Tribune Model School celebrated its first event of the session 2018-19, the Investiture & award Ceremony in the premises School. The atmosphere of the morning was set by the melodious school choir with their semi-classical motivational song. The dance choreographed to the composition of Rabindranath Tagore’s Shanti Geet added a soothing flavor to the event. The school inducted the new council for the session 2018-19 who pledged to bestow their duties to the best of their abilities. 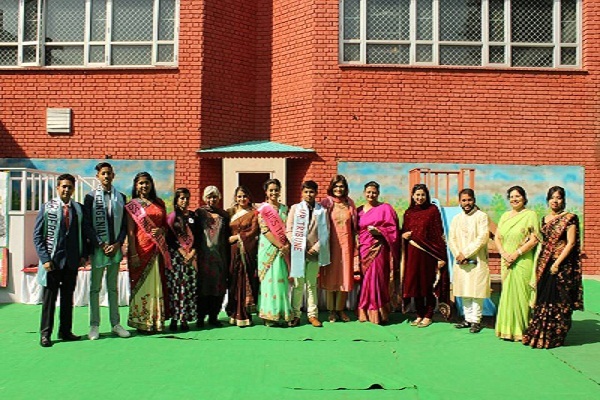 The Honourable Chief Guest Dr. Ranjana Malik, the former President of the Army Wives Welfare Association boosted the morale of the student council with her inspirational speech based on her life as wife of the former Army Chief General VP Malik. The meritorious students of the year were awarded with the awards and prizes. The scholarships were announced, The Ashok and Sneh Sharma Memorial Trophy for the promising student 2018 was Gulistan Parveen. The Harish Chandra Saxena Memorial Best All Round Trophy for the best all round girls was awarded to Pooja and the best all round boys to Shivansh. Ms.Vandana Saxena, the principal congratulated the students for their achievements and motivated them to emerge as responsible future leaders. The ceremony was held with lots of zeal and zest. 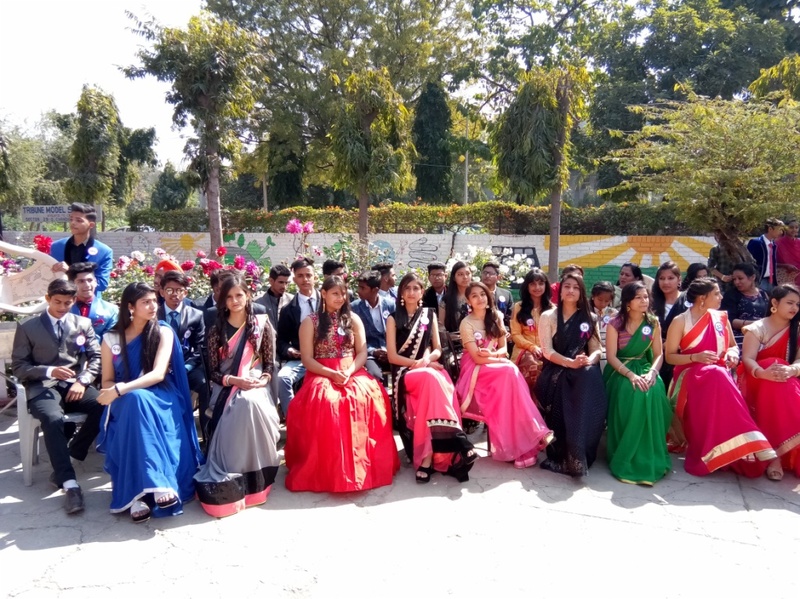 To bid adieu to outgoing class X Students and wishing them good luck a farewell party was organized by the Students of class IX in the premises of Tribune Model School. The entire staff of the school attended the function to bless the students. The emotional get together was embedded with a variety of programs like ramp walk, dances, songs and exchange of views and pieces of advice to their juniors. This annual exhibition is the work of 234 Students from Classes IV-X. These children will speak to you in the language of their heart and soul through their art work. Kalasangam 2017 showcases works that draw inspiration from the 20th century art movement. Annual Musical Presentation 2017 "Navchetna"
On 30th November, 2017, 207 students of classes IV – IX of the Tribune Model School staged their Annual Musical Presentation “Nav Chetna”. The show commenced with the mesmerizing Sargam Geet of the Raag Shankara by the School Choir. Under the direction of Mr. Vijay Kumar, Anish Benjwal and Sarika, as Baul Fakirs unfolded the state of human mind, the consequences of common reactions and recognition of the righteous path. The melodious classics and recitals composed by Mr. Atul Dubey brought life to the show. Himanshu, as Gurmukh the car mechanic promoted the ways of Namaskar, Sanskaar, Paropkar and Sakshatkaar as the foundation of a peaceful path in life. Mehak, as Narad Muni showcased the transilience of Ratnakar, the traitor played by Sumit, into Rishi Valmiki. The audience was captivated by the choreography of Ms. Suchitra and Mr. Rahul Gupta. Bhavesh, as the old man exemplified Karma by recollecting his actions of the past to save his own son from the agony of deeds, he himself went through. Shivansh portrayed the journey of Pundlik, an addict into a true devotee of Bhagvaan Vithala through the guidance of Kukut Muni who aroused in him the virtue of right conduct as a basis of purification of the soul. Mr. Ashish conceptualized the blend of the mind, body and soul through yogic asanas that enthralled the audience. The creative set design and properties by Mrs. Amanpreet and Ms. Harinder added authenticity to the stage setting. Principal Mrs. Vandana Saxena congratulated the students and teachers for presenting thought provoking glimpses of life. The Sixth Annual Athletic Meet of Tribune Model School was held in the sports complex of Sector 7 Chandigarh. The Motto of the meet “True sportsmanship is Excellence in Motion” was followed to the letter and spirit. 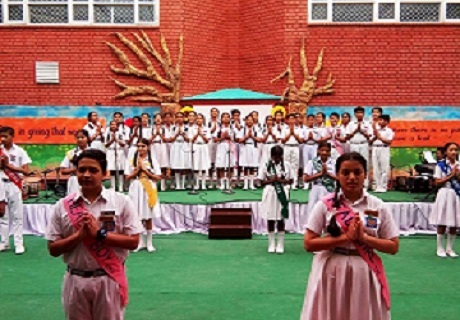 The opening day saw the event being started by prayer followed by flag hoisting, oath taking and graced by the Honorable Ma’am Principal Mrs. Vandana Saxena. The meet was declared open by her with great zeal. Mr. Sandeep Chandana and Mr. Rahul Saini from physical education and sports department of Government College Sector 11 assisted the event. The Second day of the Sixth Annual Athletic Meet of Tribune Model School saw high levels of enthusiasm amongst all the participants. 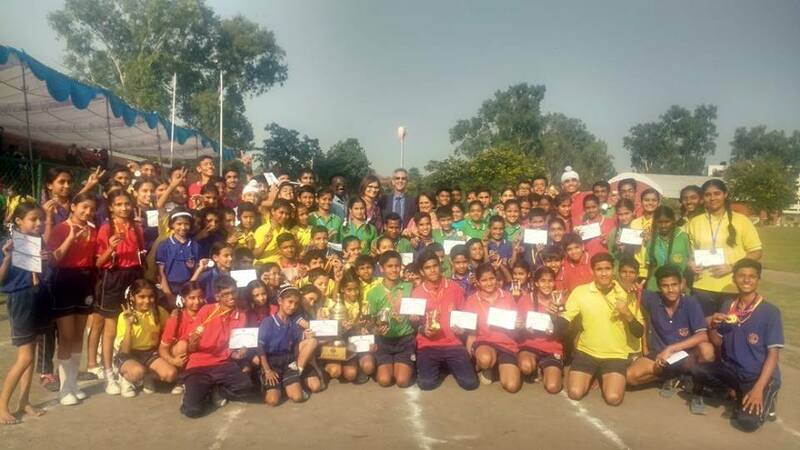 The third and the concluding day of the Sixth Annual Athletic Meet of Tribune Model School saw the culmination of a very enthusiastic sports meet. Dr. Anton Reinfelder Managing Director Groz- BeckertAsia Pvt. 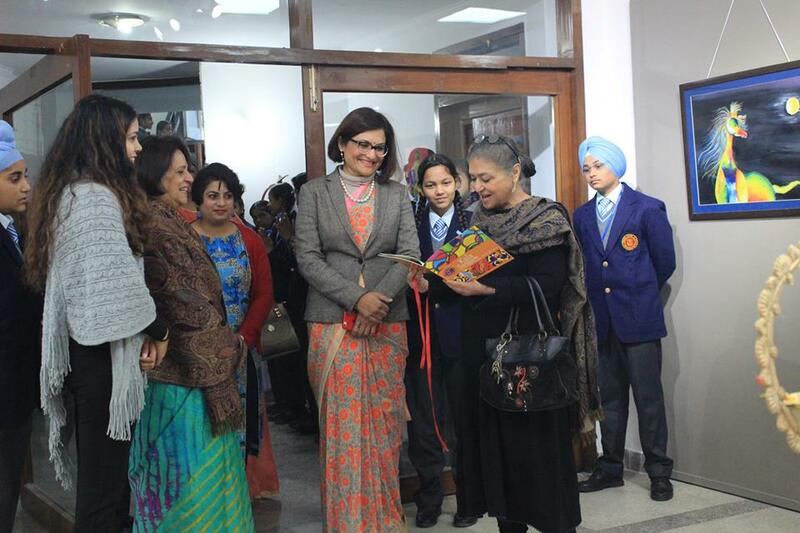 Ltd., Chandigarh, India, Chairperson Tribune Model School, Mrs. Chand Nehru graced the occasion by their benign presence. Chanakya House declared as overall best. Alok of Dronacharya House, Harh Yadav of Vishwamitra House, Sohit of Shankracharya House bagged best athlete award in the categories of under 12, under 14 and under 17 for boys respectively. Mamta of Shankracharya House, Kritika of Dronacharya House, Kumkum of Chanakya House got best athlete award in the categories of under 12, under 14 and under 17 for girls respectively. External sports experts Mr. Sandeep Chandana and Mr. Rahul Saini were honoured by the Chief Guest. The 3 days long 6th Annual Athletic Meet concluded with the lowering of school flag by the Principal Mrs. Vandana Saxena. The event ended with the hope of new beginning. Tribune Model School, Chandigarh organized 2nd Tribune Trust Football Tournament to mark the Birth Anniversary of Legendary Hockey Player Major Dhyan Chand from August 30, 2017 to Sept. 01, 2017. On Day 1, Apart from the hosts - 10 different - different schools from Tricity participated in this championship. The Motto of this Tournament is "Free Playfields of Gender Inequality". Tribune Model School held the Investiture Ceremony today with great enthusiasm. This ceremony marked a significant beginning of the new academic year. It was a solemn occasion where the young students were all prepared to don the mantle of leadership and discharge the responsibilities entrusted upon them by the school. The students were felicitated with Scholarships for academics, sports, music and art. Dr. Joseph Emmanuel, the Regional Officer C.B.S.E., Panchkula, the Chief Guest appreciated the efforts by the school for providing opportunities to the students to take part in activities like these. The Principal, Ms. Vandana Saxena, congratulated the newly elected council members and stressed on the significance of setting priorities and the need to be great communicators. The ceremony ended with a motivational song ‘We can make a difference...’ sung by the school choir. 126 students of the Kindergarten from the Tribune Model School showcased two tales of friendship based on Walt Disney’s “Winnie the Pooh” as their Annual Musical Presentation. Prerna of class U.K.G. narrated the story of Piglet (Monisha) who painted “The Portrait of Friendship” depicting diverse interests of her friends. Ms. Supriya Vashishtha directed this story.Prapti of class U.K.G. narrated the story of Roo (Vaibhavi), the little Kangaroo unfolding the values of Sharing and Re-using. The little ones of Nursery and L.K.G. sang and danced to demonstrate the magic of Reduce, Recycle and Reuse. Ms. Ridhima directed this story. Mr. Atul Dubey and Mr. Sandeep strung the two tales together with mesmerizing songs sung by the tiny tots Choir while Ms. Seema Gupta choreographed the foot-tapping notes. The motto “Fit is Fine” was emphasized by the bouncy “Tiggers Drill” composed by Mr. Sachin. Mrs. Amanpreet and Mr. Anil from the Department of Fine Arts transformed the school premises into a Mini Disney land with a vibrant stage set-up and beautiful artifacts created by the tiny tots. The show was coordinated by Ms Anupma. 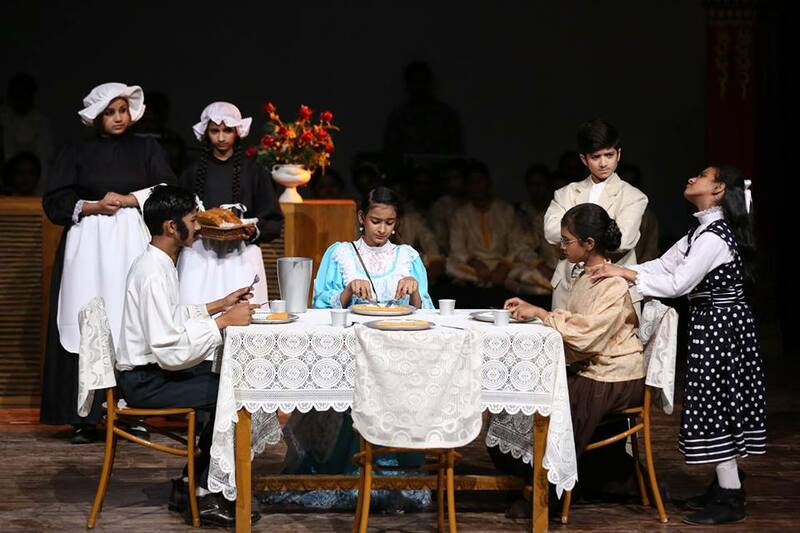 The Principal, Mrs. Vandana Saxena congratulated the staff and students for staging the show to great perfection. 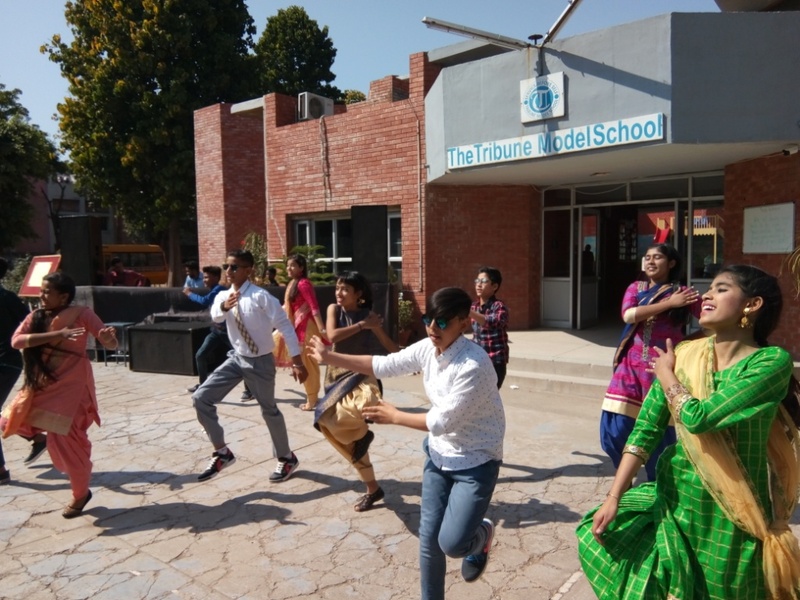 Management, staff members and the students of Tribune Model School, bid adieu to the students of Class X at a farewell function held on Feb 23, 2017.The students of Class IX presented an entertaining cultural programme which added colour to the party. Principal Ms.Vandana Saxena extended her blessings and best wishes to the students for their bright future. A Special Assembly was conducted by the Hindi Department of TMS to celebrate “Matribhasha Diwas”. Children were enlightened about the linguistic diversity of our country. They were encouraged to use other Indian languages to connect to the varied culture of India. The melodious group singing of the well known song “Mile Sur Mera Tumhara...” unified the entire TMS fraternity with the sentiment of “UNITY IN DIVERSITY”. Tilak ceremony of Class X was performed in Tribune Model School on Feb 20, 2017. The program was hosted by the students of class IX for the students of class X who are going to appear in Board Exams. The Principal and teachers blessed the students by applying Tilak on their forehead and wished them good luck for the board exams. Sahil, Rahul, Neha, and many other students of class X shared their school memories and experiences with others. Principal Ma'am's words of wisdom were gathered as precious pearls by students. Lastly, all present wished the outgoing class students good luck for their future. 81 students of Classes II & III of the Tribune Model School staged “The Adventures of the Pied Piper of Hamlin.” The Christmas spirit of love, peace and joy was expanded through the enactment of this story that highlighted the value of “Promise”. The audience of parents rejoiced in seeing their children sing, dance and act. Christmas Carols lit up the atmosphere as season’s greetings and happiness was shared by all. Tribune Model School organized a two-day workshop for educators to gauge ways and means of enhancing learning for the betterment of students, self and society. Professor B.L. Handoo, a Teacher Educator and Managing Director of IECS (Indira Educational Consultancy Services), was the guide and mentor for the teachers. At the in house session on December 9,2016 , Professor Handoo sensitized the Tribune teachers through case studies and anecdotes of his vast experience about Improving School Performances, Lesson Planning, Mind Mapping and High Order Thinking Skills. The school extended the learning opportunity for other city schools as well on December 10, 2016 at the Golden Jubilee Hall, Panjab University, Chandigarh. 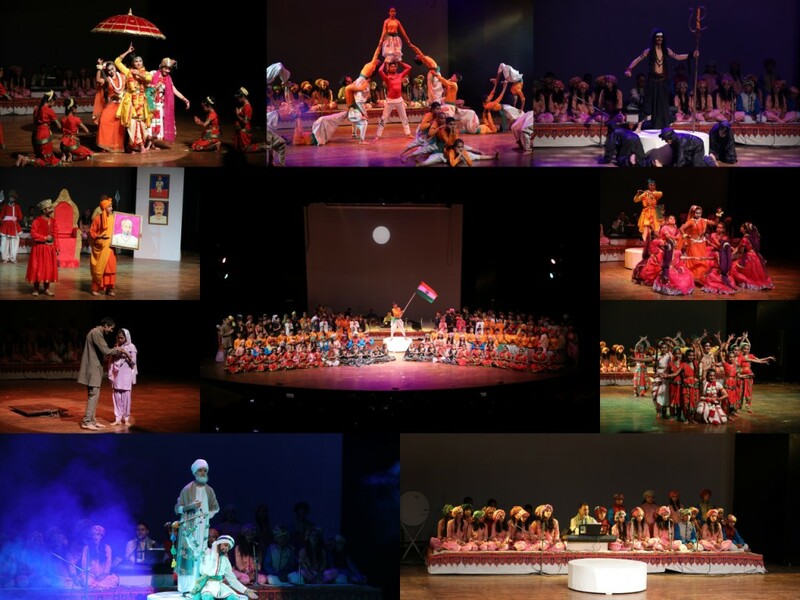 177 students of Tribune Model School staged the essence of Bhaav, Raag and Taal in harmony through their Annual Musical Dance Drama - "Bharata". This presentation directed by Mr. Vijay Kumar depicted the subtle thread of spirituality that distinguishes the Indian culture and tradition from the rest of the world. Mrs. Vandana Saxena, Principal, congratulated the teachers and students for showcasing a historical journey that left trails of hard work, teamwork, divinity and self-awareness as the foundation of a Valuable Character. The Tribune Model School unveiled the ingenious expressions of the students at the Annual School Exhibition “Kala Sangam 2016 – 17”. 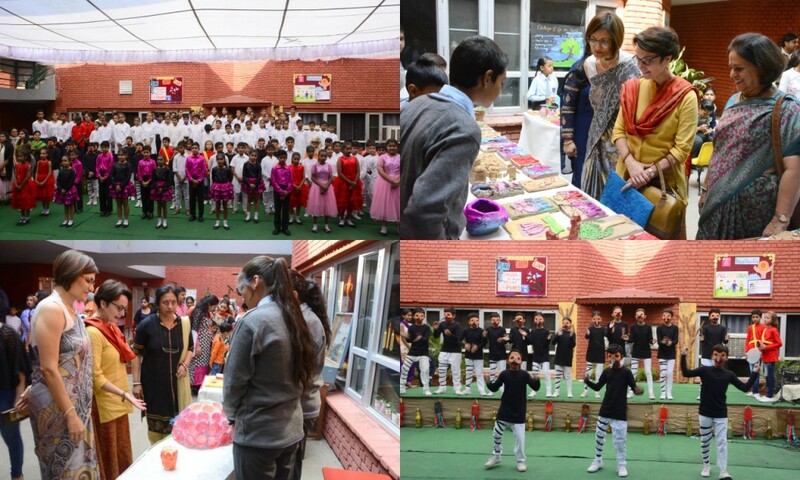 The school premises wore a festive look showcasing the joy of creativity based on six distinct Sustainable Development Goals 2030 of the U.N. The thematic display was inaugurated by Mrs. Aline Brault, working for the Government of Canada’s Department of Global Affairs and a promoter of arts. The Mosaic Makers and Electric Vision Clubs depicted different means of conserving and renewing energy while the Photography and Painting Clubs promoted Gender Equality. The Choir groups, Sur Sangam, Swarmala and Vedic Soldiers enchanted the audience with their melodious compositions based on Peace and Justice. Gardening and Fitness Hour Clubs highlighted the significance of good health and well being along with delicious and healthy stalls displaying the culinary skills of the students. The traditional technique of Tie & Dye added a colorful dimension to the skillful Cuts & Folds Club exhibiting a brilliant Home Décor partnership. The Nukkad Natak, Rhyme & Chime and Web Designing Club brought thought provoking instances towards cleanliness and sanitation. The imaginative strength and artistic talents of the students was appreciated by the parents and guests. The 5th Annual Athletic Meet 2016 of the Tribune Model School was held from Oct. 3 to Oct. 8, 2016 amidst coordinated teamwork and victories. Mr. Sunil Nehru from Delhi, an eminent Mechanical Engineer, a traveler, trekker and Scuba Diver was the Chief Guest for the final day. 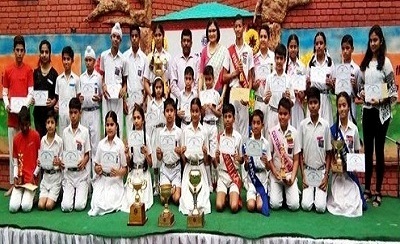 Khushi Rana, Kartik, Sanyam, Kritika, Aman, Kumkum, Ayush and Kiran emerged as Best Athletes. The Sports Trophy was bagged by Vishwamitra House for an outstanding performance in the weeklong events. Mrs. Vandana Saxena, Principal, distributed the prizes and certificates to the winning students and congratulated the participants for their effort. 52 students of Tribune Model School presented a musical “The Rainbow Fish” on the theme “Sharing”. The assembly commenced with Ganesh Vandana followed by magnificent performance of the students of Classes I A and I B enacting the journey of the majestic Rainbow Fish who experienced the joy of giving. Anu, Mahi, Naman, Minakshi and Om strung the story enthusiastically with their chirpy voices. The students adorned as beautiful sea creatures signified the values of love, friendship and sharing as the means of inner happiness. The school premises was decked up into a little sea world with art and craft display made by the students. Adult Literacy Program has been introduced in TMS in collaboration with Rotary Club, Mohali. The Chief Guest, Mr. Sukhpreet Singh Giani distributed literacy kits and dictionaries to the students of class VIII who will be teaching the didis and bhaiyas of the school. The Past Presidents Rotarians, Ms. Surinder Bains and Mr. Navneet Saxena were also present during the program. Ishan and Tarleen of classes IX and X respectively spoke on the importance of 'Quality Education'. The Arts Department of TMS organized a workshop on " Art for Inner Development" , a journey from words to visuals. The objective of the workshop was to know about Sustainable development goals, Think global solutions, Share ideas with good people doing good things, Expressing our solutions as visuals, Exhibiting art work and Appreciating each other's work and To be active and engaged global citizens. The workshop commenced with an interactive presentation on sustainable development goals by the Principal, Ms. Vandana Saxena followed by a presentation and demonstration by Prof. Ravinder Kumar Sharma on “Art for Sustainable Development”. About 100 teachers and children from schools like Yadvindra Public School, Saint Kabir School, Bhavan Vidyalaya School, Saupins School, Mount Carmel, Shri Aurobindo School of Integral Education, S.I.S Public School, Saint Soldier International Convent School, Ashiana Public School, Paragon Convent School and Tribune Model School collaboratively worked together and made innovative posters on special issues with slogans. Children expressed themselves beautifully through collage making and painting. TMS organized the 1st Tribune Trust Football Tournament from August 29 to August 31, 2016 to mark the celebrations of National Sports Day 2016. Eight schools from across the tri-city participated on the first day of the tournament. The semi-finals were held on Day 2 between Kundan International, Chandigarh, Ajit Karam Singh International Public School, Chandigarh, YPS, Mohali and Tribune Model School, Chandigarh.The Tournament culminated on August 31, 2016. The chief guest for the day was Mr. Jesse Grewal, a renowned Golf teaching professional of the country along with Mrs. Chand Nehru, Chairperson, Tribune Model School. 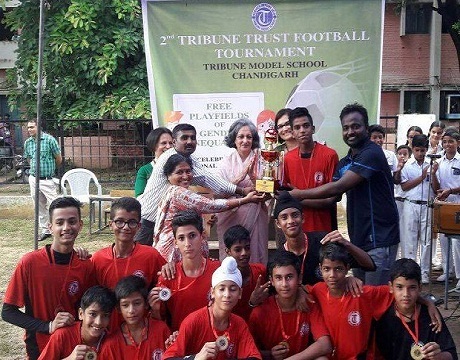 Tribune Model School reserved the third position in the tournament beating Kundan International through a tie breaker. In the penalty shoot-outs TMS emerged victorious by 2-1. In the final match, YPS, Mohali took lead against Ajit Karam Singh International Public School and emerged as winners of the Tribune Trust Football Tournament Trophy with a score of 2-1. The teams were awarded with medals and certificates. The Student Council of Tribune Model School was sworn in amidst an air of enthusiasm and anticipation at the Investiture and Awards Ceremony 2016-17 on May 7, 2016. The programme commenced with the lighting of the lamp by the chief guest, Mrs. Neelam Man Singh Chaudhary, a well known Theatre Artist and other dignitaries. The newly appointed Council members, adorned in sashes marched vigorously with their contingents signifying sincerity and discipline. Sahil Yadav, the school Head Boy ,Yasmeen, the school Head girl, Santosh, the Social Services Head, Rahul, the Cultural Head and Ashish, the Sports Captain presented the Annual Report 2015-16 after administering the oath.The Harish Chandra Saxena Memorial Scholarship Best All Round student - Boy and Girl were awarded to Anish Benjwal and Deepika respectively from Class IX.The Ashok and Sneh Sharma Memorial Scholarship for the Most Promising Student was reserved by Rahul Maurya of Class X. The 4th Annual Athletic Meet 2015 of the Tribune Model School was celebrated for a week amidst coordinated team work and victories. Aditya Pratap Singh, Mamta, Sourav, Jaspreet, Ayush Reikhy, Prerna, Ashish and Ruchika emerged as Best Athletes among different categories. 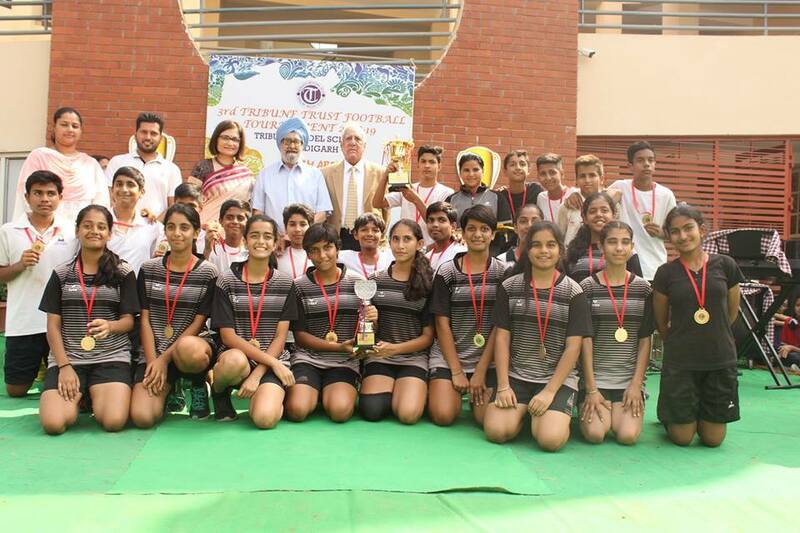 The Sports Trophy 2015 was bagged by the Vishwamitra House for an outstanding performance in the weeklong events. Mrs. Vandana Saxena, Principal, distributed the prizes and certificates to the winning students and congratulated the participants for their effort.